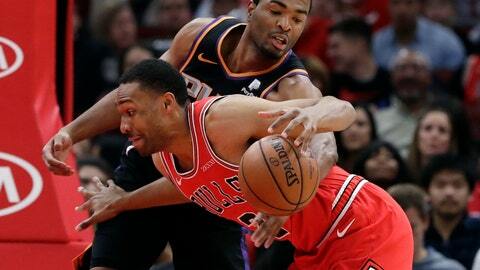 CHICAGO (AP) — Jabari Parker and the Chicago Bulls pushed the ball whenever they had the chance. They stayed focused when the Phoenix Suns made a big play. Jamal Crawford’s pullup jumper for the Suns tied it at 97 with 10:54 left, but the Bulls responded with a 10-0 run. Parker had a driving dunk before Blakeney capped the decisive sequence with a jumper with 7:27 remaining. Phoenix pulled within three on Warren’s 3-pointer with 1:27 to go, but Arcidiacono found Carter for a layup and LaVine made two foul shots to help close it out. Arcidiacono gave Chicago a spark when he jumped over Phoenix’s bench while trying to save a ball from going out of bounds in the first quarter. He landed on a couple of fans in the front row, causing a man to lose some of his beer, but everyone was OK.
Suns: Crawford had a season-high 16 points against his first NBA team. … It was Ayton’s 10th double-double of his rookie season. … Phoenix shot 49 percent from the field.